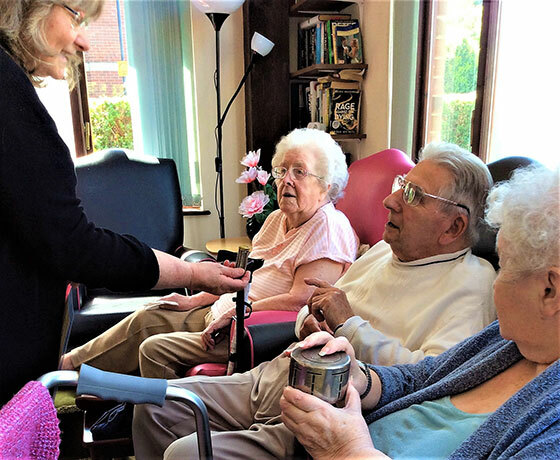 Independent Arts is delighted to have received funding from The Dunhill Medical Trust to launch an ambitious two-year project to make care homes a hub for creativity and the arts. The funding will allow care homes to receive staff training and arts provision to help boost confidence and understanding of the importance of the arts for quality of life, health and wellbeing. In turn these improvements will translate to a better working environment for care staff, a better home for residents and improvements in CQC (Care Quality Commission) reports. The project will be evaluated by a team from Winchester University. Morning workshops will encourage conversation and sharing, drawing on items from the Museums’ Heritage Loans Service, sound archive, footage, songs, poetry and stories. Afternoons will follow on with a range of arts-based workshops designed to complement the conversation points from the morning. These will include a practical art activity and music or film. 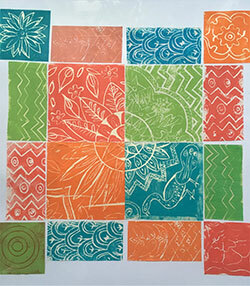 These colourful prints were produced in a Changing Spaces workshop by residents at Inglefield Nursing Home. Residents enjoyed a session on Indian Art, looking at a range of Indian resources including hand-carved wooden printing blocks and images of elaborate architectural carving from Indian Palaces. Using pre-cut lino residents then used rollers, ink and various coloured tissues to produce the beautiful image depicting the different seasons.